If life insurance companies, Medicare and Social Security are to survive, a lid has to be kept on “adult mortality reductions.” It is no wonder modern medicine stonewalls an anti-aging pill. And one such vitamin pill, now in common use that could be employed to make up for a lifespan shortening genetic flaw, when taken habitually in the right dose and frequency, could serve as such a longevity pill. The current increases in “age-at-death” numbers are only part of the story. Far longer lifespans are within reach if existing science is put into practice. To address this subject properly readers need to be briefed on how longevity numbers are tabulated and presented which is as population data, not individual data. Individuals aren’t confined to achieving superlongevity in lock-step fashion with the rest of humanity. So when researchers who study human aging recently released a study showing the maximum human lifespan is not rising and mistakenly concluded there is a limit to what longevity research can achieve, longevity seekers’ hopes were dashed. That report said no one is likely to live beyond 122 years, which is how long the longest living human in modern times, Jean Calment (1875-1997), lived in France. While longevity studies do tabulate maximum lifespan in a population, that is a shifting number as individuals age. Aggregate data from large populations may hide the fact some individuals may be able to achieve extraordinary increases in individual lifespan in the near future. Whatever certain individuals who are 40-50 years old may be habitually doing today to achieve superlongevity tomorrow may not be realized for another 70 or 80 years when they reach age 120. And a small percentage of human populations are already putting a known longevity mechanism into practice every day without an understanding of its full potential to turn them into super-longevinarians. This isn’t “one small step for man” but rather “one giant leap for mankind” as astronaut Neil Armstrong said as he took his first steps on the moon. While the median and maximum lifespan may be slowly inching upward, individuals may achieve exponential increases in lifespan if what has been recently achieved in the animal lab can be duplicated in humans. Before results of that experiment are presented here, readers need to learn about a universal gene mutation that occurred many generations ago that has limited the human lifespan. A gene (GULO gene) in the liver that produces the gulonolactone oxidase enzyme is said to be so badly mutated it is called a pseudogene. This is the gene that produces the last of a series of enzymes requisite to produce vitamin C internally. Most animals, except primate monkeys, fruit bats, guinea pigs and some species of fish, naturally produce their own vitamin C. These mammals have the same gene mutation as humans. Wild animals unable to synthesize vitamin C consume far more vitamin C than the recommended daily allowance for adult humans in the USA. Here is a comparison chart. Probably one of the greatest discoveries in the history of medicine was announced in 1912 when Casimir Funk first conceived that there are components within food that are essential for life which he called “vita amines” or “vitamins,” that can make up for a universal gene mutation that has severely limited the human lifespan. Then in the 1930s Albert Szent-Györgyi discovered vitamin C, which became known as the human body’s great electron donor, rebalancing atoms to counter toxic forms of oxygen known as free radicals. Despite the discovery of vitamin C and its synthetic production in the 1930s, humanity has never fully recovered from this gene mutation that occurred long ago in the history of mankind. Medicine downplayed vitamin C and employed synthetically engineered molecules that require a doctor’s prescription that have elevated the cost of medicine today beyond affordability without ever fully addressing this major universal genetic flaw in humans. Today most diseases are treated as if they are drug rather than nutrient deficiencies. For example, in light of an ongoing diabesity epidemic that has spread globally, consider that sedentary obese men and women who partially make up for this gene mutation by taking a 500 mg vitamin C supplement experience a -5.9 kilogram (nearly 13 pound) weight loss. The demonstrated ability of vitamin C to reduce obesity is pertinent because rising rates of obesity have an offsetting negative impact on mortality rate reduction now being achieved by an unprecedented decline in smoking. While metabolic disease plagues modern man, it is noteworthy that guinea pigs, one of the few animals which have the same genetic flaw as humans and do not internally synthesize vitamin C, experience a measurable rise in blood sugar that is only corrected when 10 milligrams of vitamin C is added to their diet. A typical adult guinea pig weighs ~2.2 lbs. If this data can be extrapolated to humans, a 154-lb. (70 kilogram) adult human would require 700 milligrams of supplemental vitamin C to achieve normal healthy blood sugar levels. That is far more than public health authorities recommend. Humans are advised that 60-200 milligrams of vitamin C. Just 5 mg is sufficient to avert scurvy, which is evidenced by bleeding gums, small hemorrhages in the eyes and skin, fatigue, joint pains and lassitude. This paltry amount of vitamin C won’t raise blood levels enough to control blood sugar let alone achieve a longevity effect. Physical or mental stress may increase the need for vitamin C. The Recommended Daily Allowance and Daily Value for vitamin C were established for healthy individuals, not those who have greater need such as subjects with diabetes, cancer, heart disease or those individuals who take vitamin C-depleting drugs like aspirin, estrogen, steroidal anti-inflammatory drugs and water pills (diuretics) and antacids. Given that tobacco use takes 10 years off a smoker’s life, mortality rates, in particular cancer death rates, are dropping to all-time lows as more and more individuals abandon tobacco. Each cigarette smoked shortens life by ~11 minutes. Some of those years can be regained by smoking cessation. Furthermore, animals that produce vitamin C internally don’t get heart attacks. Inexplicably, physicians ignore the inherent vitamin C problem and place their patients on problematic (liver toxic) statin drugs to lower circulating cholesterol levels that do reduce cholesterol production from the liver but do not reduce the risk for a mortal heart attack. Contrast this with a long forgotten study published in 1998 that showed individuals who supplemented their diet with 500 milligrams of vitamin C daily which caused their vitamin C blood levels to rise from 13.5 to 51.7 micromoles per blood sample. Vitamin C blood levels above 50 micromoles are associated with more than a 50% reduction in heart disease mortality. Cholesterol phobia rather than a vitamin C shortage became the primary focus of modern medicine. Even then, 500-1000 mg of vitamin C lowers circulating levels of cholesterol. Low vitamin C levels (below 25-30 micromole concentration per blood sample) are a stronger predictor of future heart disease than blood cholesterol levels. Even just 300 mg (5 times the Recommended Daily Value) of supplemental vitamin C has been shown to significantly reduce cholesterol levels. But statin cholesterol-lowering drugs are the standard of care rather than ascorbic acid. Despite all this science, the Recommended Daily Allowance (the amount considered sufficient for 97-98% of healthy people) for vitamin C remains at an abysmal 90 milligrams. That amounts to ~one-half of a milligram per pound (1.28 mg per kilogram) of body weight. That amount of vitamin C may prevent scurvy but will not maintain health. No similar genetically flawed animal (guinea pigs, fruit bats or monkeys) can maintain health at such a low intake level. One conclusion from this that can be drawn is that human populations are being gamed by modern medicine so there is enough disease to treat. With all of that said, there is convincing evidence from animal lab experiments that supplemental vitamin C can be employed to achieve superlongevity. As previously stated, if what has recently been discovered in the animal lab can be extrapolated and applied to humans, another extraordinary jump in human life expectancy may be in order for the few people living in developed countries who regularly supplement their diet with an ample amount of vitamin C.
That jump in the median lifespan of homo sapiens would be as much as 2.7 fold, or an increase from ~80 years to 216 years! That would be beyond belief. But this what was actually demonstrated with animals that have a shorter lifespan than humans. In 2016 researchers who study aging compared and contrasted the differences in the healthspan and lifespan of animals that internally produce their own vitamin C (as most animals do) with those animals that don’t (such as humans) and the outcome of that study was startling. Genetically intact laboratory mice were found to have blood levels of vitamin C ~58.0-micromole concentration emanating from internal production and achieved a 23.8 month median lifespan with a maximum lifespan of 30.0 months. Contrast that with mice given a miniscule amount of vitamin C that only attained a blood concentration of 11.0 micromole and achieved an 8.5-month median lifespan and a maximum lifespan of 16.0 months. Only a small percentage of humans have a vitamin C blood level that low. But that still amounts to millions of people. The striking discovery was that mice that were genetically altered to NOT produce vitamin C and then supplied with an ample amount of oral vitamin C to achieve a 61.0 micromole blood concentration, lived as long as mice that naturally produce their own vitamin C (23.0 months median lifespan/ 32.0 months maximum lifespan)! Now most modern day humans don’t exhibit blood levels as low as 11-micromole per blood sample like the genetically altered mice, but only those individuals who consume vitamin C dietary supplements are likely to regularly achieve the blood levels commensurate with a 23-month median lifespan (32-month maximum lifespan). It is clear to see from the data presented below, millions of Americans are in the same predicament as a genetically flawed animal with no functional GULO gene to synthesize vitamin C and suffer from an inadequate intake of dietary vitamin C.
Smokers, whose lifespan is cut short by about ten years, need more vitamin C and comprise a greater portion of the vitamin C deficient population. The commonly reported longer lifespans of females may in part be attributed to their lower rate of smoking than males. * In reality all humans are vitamin C deficient in that they don’t internally produce vitamin C and are totally reliant upon the diet for this essential vitamin. Source: American Journal Clinical Nutrition, Volume 90: pages 1252-63, 2009. So now let’s examine how many Americans exhibit a blood concentration of ~58 micromole of vitamin C per blood sample that was achieved in genetically flawed/vitamin C supplemented mice that prolonged their lives to that of mice that do naturally make vitamin C.
* All are likely to be supplement users ** it is implausible that some non-supplement users attained blood levels over 60 micromole. Flaws in the accuracy of blood tests may be involved. What is learned from this chart (above) is that most American adults, even vitamin supplement users, do NOT attain the same or greater blood level (58 micromole) that prolonged the life of laboratory mice, with women over age 60 being the exception (which is likely to be due to supplement use). Only the top ten percent of supplement users and non-users reliably averaged greater than 58 micromole blood levels of vitamin C.
This provokes the obvious question: how much supplemental vitamin C do humans need to take to achieve that same restorative blood level that extended the lifespan of genetically altered laboratory animals to equal those of animals that naturally secrete vitamin C? The answer appears to be 500-1000 milligrams of vitamin C per day. And as we will learn, to maintain that blood level (~60 micromole) repeated doses, 3-to-4 times a day, may be required as vitamin C is rapidly excreted from the body. Researchers Steve Hickey PhD and Hilary Roberts PhD of Manchester, England have shown that 500 milligrams of vitamin C consumed every 4-6 hours can achieve blood levels exceeding 220 micromoles, enough to even non-toxically kill cancer cells. But that is far higher intake of vitamin C from the diet plus supplements than what a recent survey shows Americans consume – no more than 214 milligrams on average per day from diet + supplements (see chart below). According to the Council For Responsible Nutrition, 76% of Americans take dietary supplements and 34% of these supplement users take a vitamin C pill. Out of a population of 323 million (2016), there would be ~245 million supplement users (some of these Americans take a multivitamin with usually a sparse amount of vitamin C in them) and just 83 million Americans would take vitamin C supplements. Maybe just ~2% of vitamin C supplement users would be taking an adequate dose to achieve ~60 micromole blood concentration throughout the day. That would amount to ~1,660,000 devoted vitamin C pill takers or about one-half of one-percent of the population. Regarding nutrient intake levels of vitamin C, 48% of non- supplement users were below the Estimated Average Requirement (60-75 mg). Only 1 to 2% of adult supplement users in various age groups had vitamin C intakes that were above the Upper Limit (2000 mg). Critics claim vitamin C is rapidly excreted via urine flow and only creates “expensive urine.” (Nothing is said of water-soluble drugs that suffer the same fate.) In order to help maintain high blood levels of vitamin C throughout the day, slow release tablets and capsules may be used. Or accompaniment with bioflavonoids slows vitamin C absorption and has a similar effect. Bioflavonoids slow its overall absorption and less is excreted in urine flow. From the U.S. National Institutes of Health: [In humans] Approximately 70%–90% of vitamin C is absorbed at moderate intakes of 30–180 mg/day. However, at doses above 1,000 mg/day, absorption is said to fall to less than 50%. This would be a self-limiting mechanism that curbs side effects. The body pool of vitamin C ranges from 300 milligrams in cases of scurvy to 2000 milligrams at maximum. So complete depletion of vitamin C from body stores may take a while. So humans can endure periods of low vitamin C intake without experiencing overt symptoms. Smokers typically exhibit blood levels that are a third lower than non-smokers (35.2 compared to 50.7 in men and 38.6 compared to 58.0 in women). However, we should be aware that surveys show 43% of smokers supplement with vitamin C.
Only about 3 in 10 supplement users have been taking vitamin C for 10 years or more. This would comprise the group with the best chance of achieving extraordinary lifespan expansion. Are mice similar to humans? Do experiments with mice translate into applied science in humans? While mice often respond to experimental interventions in ways that differ from humans, biologists report that gene regulation in mice and humans has many similarities. What happens when mutant animals with no GULO gene receive replacement vitamin C? 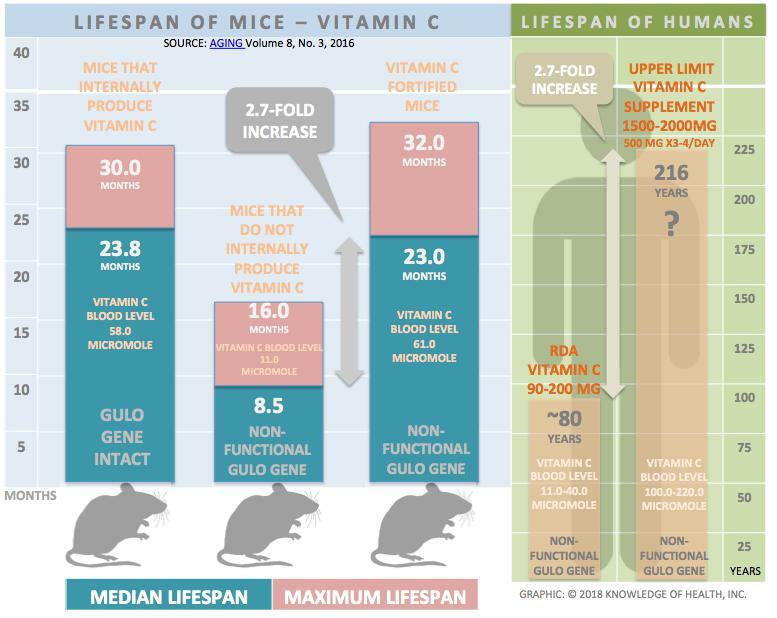 Aside from living longer here is what happens when vitamin C is replenished in genetically flawed (GULO-gene negative) mice? Replacement vitamin C protects against accumulation of beta amyloid plaque in the brain that is associated with Alzheimer’s disease. Replacement vitamin C inhibits growth and spread of implanted tumors via a 98% reduction of growth factors measured in vitamin C-deficient mice. Replacement vitamin C inhibits a cellular signal (hypoxia inducing factor-1) that converts cancer cells from using oxygen to utilization of sugar for growth. Replacement vitamin C protects red blood cells from being deformed as blood sugar levels rise. Replacement vitamin C prevented behavioral changes typically seen in genetically flawed mice without a GULO gene such as diminished physical strength, abnormal motor nerve control, depressed mood and a craving for sugar. Sadly, the full health and longevity benefits of vitamin C remain largely confined to laboratory animals during experiments. It appears an even greater reduction in mortality from heart attacks, cancer, obesity and all-cause death can be achieved with widespread vitamin C supplementation in doses that exceed current recommendations. Consumers are grossly misled and needlessly warned away from so-called mega-dose vitamin C whose potential gastric side effects are curbed by rapid excretion via urine flow and diminished absorption as dose increases. Vitamin C pills can be economically purchased for less than 15-cents a day (4 pills a day = annual investment: ~$175/year). Vitamin C would be the best health insurance anyone could buy, exceeding the value of any existing drug benefit plan, Obamacare, or any other medical care payment plan. It would be a “no-brainer” (no controlled study needed) to realize savings in health care costs would far exceed the cost of the vitamin C pills. A human being who embarks on a life-long vitamin C supplement regimen taking four 500-milligram tablets a day beginning from the age of 20 (the age of full-physical growth) to age 216 would spend $34,339 (not counting for inflation). Savings on healthcare costs far in excess of the cost of vitamin pills would be anticipated. It would cost more NOT to take vitamin C pills than to adhere to a daily vitamin pill regimen. There are three types of vitamin C consumers can choose from: (a) ascorbic acid; (b) buffered (alkaline, non-acidic) vitamin C usually provided as calcium or magnesium ascorbate; (3) fat-soluble ascorbyl palmitate that is retained in fatty tissues. Buffered vitamin C would be preferentially recommended to individuals whose gastric tract is sensitive to acid. However, ascorbic acid is better absorbed because it is acidic. Aside from vitamin C-depleting drugs (aspirin, estrogen, water pills/diuretics, antacids), another concern is poor absorption. Humans produce less (hydrochloric) stomach acid as they age (called hypochlorhydria), impairing vitamin C absorption from foods and supplements. Vitamin C malabsorption may also be due to H. pylori infection that affects ~half of the American population over age 60. H. pylori shuts off acid secretion, resulting in indigestion (gastritis). Vitamin C as ascorbic acid actually helps eradicate H. pylori and since it is acidic, it is better absorbed. Vitamin C secreting animals are protected from H. pylori infection in this manner. Except vitamin C supplement users, humans are not protected from H. pylori. Vitamin C even reduces bleeding from H. pylori induced gastric ulcers. The widespread prevalence of H. pylori infection is just another reason to supplement the diet with vitamin C.
In this aging-is-optional era many anti-aging pills are proposed. The most frequently mentioned and often studied are metformin (anti-diabetic drug); rapamycin (immune suppressant) and resveratrol (red wine pill). But taking these nutraceuticals will not make up for a shortage of vitamin C.
Physicians are likely to dismiss the idea of vitamin C supplementation, saying it is unproven. But it is not disproven. It is simply untested. Doctors are the gatekeepers of medicine and they remain ignorant of what is revealed in this report. The entire cadre of public health organizations that includes the National Institutes of Health, the Food & Nutrition Board and National Research Council of the National Academy of Sciences, the Food & Drug Administration, The American Medical Association, even members of the Medical Journalists’ Association, overlook this important discovery. Few if any doctors prescribe vitamin C across the board, leaving their patients to deal with each and every physical and mental manifestation of this vitamin/hormone deficiency as they occur. One of the greatest discoveries if not THE greatest discovery in the history of biology has been thrown under the rug. It was biochemist Irwin Stone who wrote in the 1970s that animals that naturally produce their own vitamin C live 12-18 times beyond the age of physical maturation (~ age 18 years when physical growth stops). Interestingly, 12 X 18 = 216 years, the precise estimate of lifespan extension posited in this report. Sadly, the landmark study that showed this genetic flaw could be completely compensated for by vitamin C supplementation, to extend the lifespan of laboratory animals with a dysfunctional GULO gene to that of animals that internally produce vitamin C, has been thrown back into the research closet, never to enter the realm of applied science. Who or what would correct this (intentional?) oversight? Addendum: Is the GULO gene completely dysfunctional? As an aside, a striking recent discovery is that the GULO gene for the gulonolactone oxidase enzyme appears to be active in human embryos, which throws the whole idea of a completely dysfunctional pseudogene out the window. Vitamin C levels in the fetus are not wholly explained by their mother’s intake of vitamin C. The mechanism for this temporary activity of the GULO gene in utero and the mechanism that disengages this gene is now understood: a stop codon. A codon is a sequence of three DNA or RNA nucleotides that corresponds with a specific amino acid or stop signal during protein synthesis. The possible restoration of the GULO gene remains intriguing. The prospect of gene editing is now on the table.